1. Will the Certified Mental Coach program give me the skills to individualize a program according to the needs and goals of a specific athlete / business person ? 2. Do you provide any power point presentations for download of the course topics or is everything is online only? 3. How long is the course? 4. Am Iqualified to participate in the CMC program? 5. 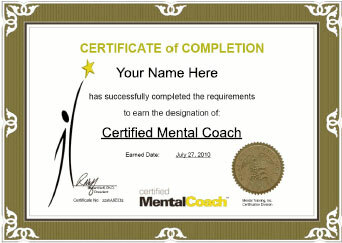 Can the Ceritifed Mental Coach program be used outside the sport/athletic arena - for business people? For other professional groups? For kids? 6. Do you think that I can start training people right after completing your program or will I need additional preparation? 7. Do you think that I can use the Certified Mental Coach training as the base of my business training and start to train professionals right after completing the course or I will need additional qualifications considering my target groups? 8. Will CMC give me a competitive advantage over other training methods/schools or I have to educate myself further in order to be competitive? 9. Does mental training as a concept and CMC have unique " face " and differentiate itself from other training covering topics as leadership , stress management , sales training? 10. Could you provide me any scientific studies proving the effectiveness of mental training? Yes, and no. Mental Coaching is a very broad and deep field. There is a lot to learn. Any online course that says it will teach you everything there is to know about mental training in a few weeks is probably lying. 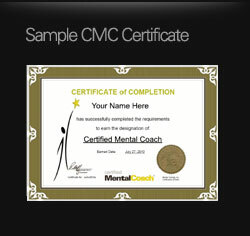 However, Certified Mental Coach has been designed by one of the leading sports psychologist researchers in the world, so it contains the latest research and the key skills that have been researched and proven to be used by almost all elite and professional athletes AND shown to have the greatest impact on performance. This is a massive bonus for you. Just knowing which skills to teach is probably the most difficult part of mental training. We've made the most difficult part of mental training easy for you by putting the most important skills into an easy to learn format. All the training is online, but there are downloads too, including a 103 page, course workbook containing all the material from the course. 3. How long is the course ? The course consists of 11 lessons that would take about 4-6 hours if you went through them all in one sitting. There are further exercises and assignments, so in total you're looking at 10-20 hours. The course workbook is 103 pages. It can be downloaded as used as a reference or for creating exercises with your athletes when you have completed the course. 4. I am neither an athletic coach nor psychologist by education - I have worked for some multinational corporations in their sales departments. I have been interested in psychology and personal development for a long time and I want to start new career. However psychotherapy is not my focus - I prefer to work with healthy people and supporting them in going above their "norm" . Given this information about my background do you think that I am qualified to participate in the CMC program? Very much so! One of the key points about mental coaching is that it is for 'normal' people who want to become extraordinary. Mental training is not for sub-normal psychological states or those suffering from psychopathology or mental disorders. These conditions require the attention of a psychologist or psychiatrist. Mental training for athletes is essentially peak performance training. The mental skills of an elite athlete are similar to the mental skills of top performers in all areas. Sales is very much a performance based area that requires strong mental skills. The same is true of any business role - having certain skills is essential to optimum performance. If you have the skills, you succeed. If you don't have the skills, you struggle. Definately - the skills you learn as a mental coach can be used to train performers in any arena - business, art, science, etc. In fact, we have a number of one-on-one clients who are business people. 6. Do you think that I can start training people right after completing your program or I will need additional preparation? You can start training after completing the course. Like everything, as you get more experience, you will improve. But the course will give you a very strong foundation in the key mental skills and how to train them. Obviously you will not know everything about mental training from one course, but you will have plenty to get you started training performers with quality skills. 7. This is more a business question : I will train more business and professional people than athletes, at least in the beginning. Do you think that I can use the Certified Mental Coach training as the base of my business training and start to train professionals right after completing the course or I will need additional qualifications considering my target groups? You can definately start training immediately after the course. As mentioned, the skills you learn as a mental coach can be applied across multiple disciplines in multiple domains. As an example, many of our student athletes report improved performance in their academics as a result of their 'athletic' mental training. Mental skills are not for athletic endeavors only. The skills are transferable, and this is one of the major benefits of this training for young adults - it gives them mental poise, self-awareness, thought control, emotion control and goal setting skills. All these skills are fundamental life skills that many children and adults are never taught. 8. As there are many coaches on the training market - NLP practitioners for example, I have to compete with them for training business executives . Will CMC give me a competitive advantage over other training methods/schools or I have to educate myself further in order to be competitive? NLP has been around for at least 30 years, so the market is saturated with coaches and NLP training is not new. Teaching business people the skills of professional athletes is not only appealing to business people, but offers a unique and exciting marketing position. Think about it. Would you rather attend an NLP sales training, or learn how a world champion athlete won a gold medal and how you can use those same skills in your work everyday? 9. More or less similar question : there are many types of training in the market today which sometimes don't differ much . Does mental training as a concept and CMC have unique " face " and differentiate itself from other training covering topics as leadership , stress management , sales training? 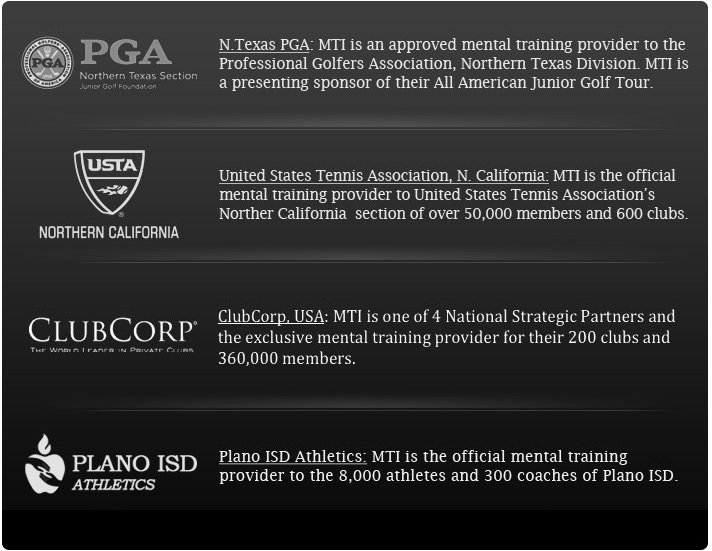 As you can see in the course outline, mental coaching has some similarities and differences from traditional training. Also remember while reading the course outline that it really includes two main parts - teaching the coach how to teach mental skills, and the actual mental skills themselves. While the Certified Mental Coach course does include some of the typical performance subjects such as leadership, it includes subjects that are omitted from most performance training such as arousal control, emotion/thought control, confidence, concentration and visualization. According to Robert Weinberg, longtime editor of the Journal of Applied Sport Psychology, writer of the Certified Mental Coach course and a Mental Training Inc board member, there are plenty of studies showing some correlation between psychological interventions and improved performance, but relatively few that demonstrate a convincing causal link. Here is an example of one such study showing a link between mental skills (visualization in this case) and performance improvements. However, would so many professional athletes use mental skills and admit they use mental skills if they didn't work? No, I don't think they would. First is a video of top athletes talking about mental skills being important and making the difference between winning and losing at the top levels of sports. OMT Pro Interviews from OnlineMentalTrainer on Vimeo. Below are 2 quick examples of top athletes using mental skills. There are many, many examples of professional athletes using mental skills, these are just two that we found with a quick search. The first video below shows Mike Cammalieri's pre-game visualization routine. Below that is a picture of Lindsay Vonn visualizing before her gold medal run at the Winter Olympics. Do mental skills really improve performance? The evidence would suggest so, although a direct causal link between mental skills and performance is yet to be conclusively proven. Mental Training Inc's 90% retention rate of new clients would suggest that our clients are convinced that mental skills improve performance!